Sejal screams seeing Vikram in blood and Raghu coming there with sword. All are shocked. Vikram’s father asks why he beat my son? Mom says who beats like this, he is an animal, we did a mistake by trusting you all, he is a goon, you deserve a groom like him. Raghu says yes I am a goon but what about him? tell them about his acts, I do everything infront of all, I am not your like your son, if I had shown my power before then you guys wouldnt have done it before. Raghu asks them to tell truth. Mom says what truth? Raghu grabs Vikram and asks mom to tell truth otherwise.. Dhanak says then what? you will kill him? kill all of us. Raghu says you dont understand. Dhanak says you keep coming to kill our happiness, let us live, go away. Raghu says I wont let this marriage happen, he throws all guests from there. He tries to attack Vikram. Dhanak stops him and says you are taking revenge from me? You and your mother are alike. Vikram runs with his family. Raghu says listen to me. Dhanak says let them go, you wanted this. Mahindra tries to stop Vikram’s parents and plead them but they leave. Dhanak shows empty mandap and says you wanted this right? you started this story but I will finish it, I will never forgive you, I told you to not my sister. Sejal falls down. Dhanak says I will talk to Vikram, everything will be fine. Mai comes there and says Raghu proved that he is my pride. Maya says tell clearly. Mai says I asked him to prove Sejal’s marriage if he loves Dhanak so he promised and broke it. Dhanak is shocked. Mai says Raghu you were right that this will be a mourning session. She leaves from there. Dhanak glares at Raghu. Raghu says give me a chance, I didnt do anything wrong. Sejal runs from there. Dhanak cries and says he has to pay for this. Mai is taking Raghu to her house. She asks Aslam to dance, Raghu won today, he broke Sejal’s wedding, today I am so happy. She dances around. ASlam asks what you did Raghu? you ended your love story. Mai starts dancing. Dhanak comes there with her family. She is about to slap Raghu but Mai stops Dhanak and says remain in limit, nobody touches my son otherwise I will kill you. Raghu says no, dont stop her, you wanted this and it happened like that, this is between me and Dhanak, let her do what she wants. Parag screams for Dhanak to come. All run to her. Sejal has locked door. Dhanak asks her to open the door, everything is fine. Dhanak says we have to break it. She forces it open. Dhanak and others run to Sejal’s room and sees her hanging from ceiling fan. They all pull her down. Raghu helps them. They put Sejal on bed. Dhanak asks her to open her eyes. They all cry but see that she is not moving. Dhanak says her heartbeats are not working, oh God. Mahindra falls back in shock. PRECAP- Raghu says to Dhanak that I want to talk to you. Dhanak throws him out of house and cries. Raghu thinks I have to talk to Dhanak. He breaks in house. 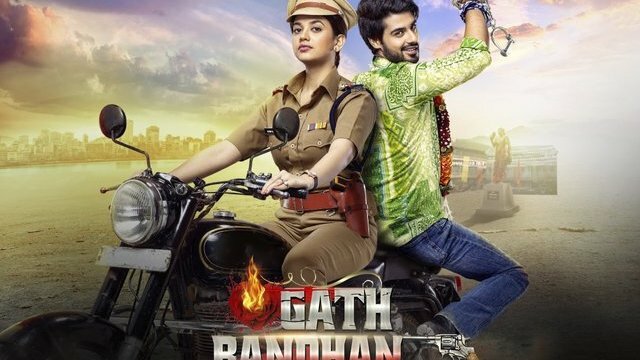 The post Gathbandhan 4th March 2019 Written Episode Update appeared first on Telly Updates.